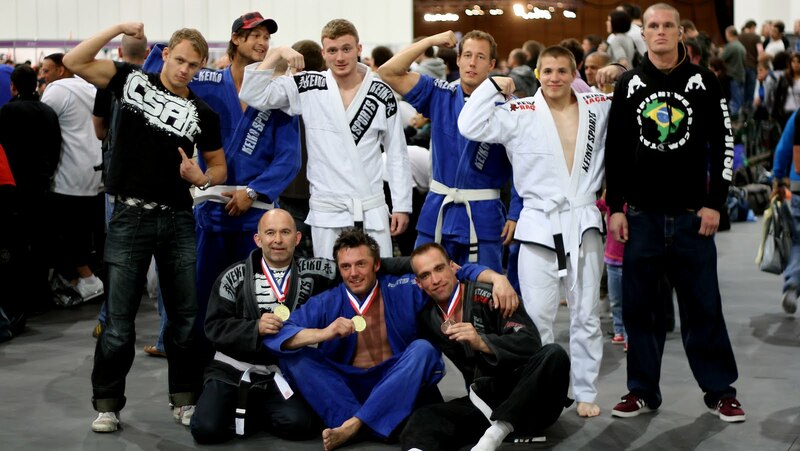 This weekend I was competing at the Gracie Invitational tournament in London, England. I had actually decided not to participate due to the knee injury I got at the last competition, but I ended up stepping on the mat anyways, and I am really glad I did it. Preparations for this event was non-existing. My last training was about three months ago due to vacation, popped elbow and latest, a knee injury. The knee has been hurting really bad, and I had only managed a few rounds of sparring with my kids team. If anyone over 50 kilos put their weight on my leg, the pain in the knee was unbearable. I did expect to not compete in London, but since I had bought the plane ticket and we were going nine guys together, I really wanted to do it. So by the deadline for signing up, I paid up the 35 pounds, so I had the chance to step on the mat, just in case I felt like competing on the day. At that point, I honestly thought that I had just thrown that money out of the window and that it would be impossible for me to go through a match with the pain in my knee. On the day of the event, I really felt like stepping on the mat. At least just to say I did it and then tap out if I felt anything in my knee. I spend an hour or so massaging my knee with tigerbalm and then wrapped it up tightly. A few painkillers and a visit from an old friend, adrenaline, took care of the rest, and I decided to go ahead and take the match. In the meantime, about five other black- and brownbelts had signed up in the weightclass, so a single match for the gold was out of the question. Also, I weighed in at a whopping 82.0 kilos, so I was actually under the lower limit of the weight class, oops :D I decided to go ahead anyways, since I was psyched to watch the other guys go at it in the higher belt divisions and I wanted to try it as well. My opponent was Nicolas Gregoriades, a fellow blogger from Jiu Jitsu Brotherhood, so we were looking at a legendary Battle of the Blogmasters. He is a solid black belt and experienced competitor, also looking quite a bit larger than me, but I was determined to do my best and see how it would go. I had no gameplan going into this match, since I thought trying the deep butterfly halfguard would be impossible with my injured knee. So I would just go with the flow and treat it as a regular roll, focusing on breathing since my cardio is worse than ever these days. We start the match and pretty quickly I go for my crossgrab single leg setup. I can feel he's got solid base, so I try to switch for a double, but he rolls me over and almost ends up in mount. From here I go deep butterfly/x-guard/footlock-guard crazy for a few minutes before he finally manages to pass my guard and get to mount where he finishes with an ezekiel choke. I had a calfcruncher and a few good sweep attempts from my guard, but it was obvious, that he was just bigger, better and more experienced, and he did a very good job of just basing out of everything I tried. I noticed how he grabbed my sleeve every time I got the x-guard sweep, which prevented me from getting up. Very nice detail, I will implement in my own game right away. After the match, something magical happend. For the first time in many, many years, I felt like it was really cool to have been competing. My immediate thought was "wow, that was awesome, I wanna do it again", something I have not felt since I was a competing as a blue belt, and something I thought I just did not have in me anymore. So I think I am going to ride that feeling and compete as much as possible, before it goes away again :) For now though, I will take some time off to focus on healing my injuries, so I can get back in training. I am getting really tired of doing nothing. 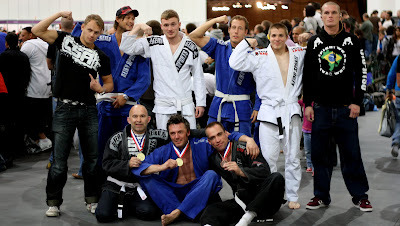 Also, it was cool to feel that I could hang with the brown/black belt division. Obviously, I got outclasses in this match, but I got the confidence, that in my right weight class (-82.3 or maybe cutting down to -76), injury free, with preparations and some more experience, I can one day do pretty good there. So I am definitely going to give it a shot and compete throughout my brown belt.